"As baseball works to be reinstated as an Olympic event, aligning our efforts with the International Baseball Federation positions Little League for growth internationally and assists with our efforts to become a global game"
Every August, millions of sports fans tune in to watch the Little League Baseball World Series, broadcast from South Williamsport, Pa., featuring two finalists in a tournament that starts in June with local all-stars competing in district tournaments all over the world. While other age groups also participate in annual Little League tournaments that lead to their own "World Series" at other sites, the iconic event in South Williamsport focuses on the "major" division, usually defined as the bracket for 11- and 12-year-old players. But many viewers get confused when they see 13-year-olds on the field. That happens because players get assigned to a division based on their age on April 30 and some of them turn 13 during the baseball season. "It's always been confusing for people when they watch the Little League World Series," said Greece Little League board member Diane Noga. "They're always confused by the age when people announce how old they are," Noga said. But in a few years, that will change because Little League Baseball is switching the age eligibility date from April 30 to Dec. 31. "It's actually something that a lot of people feel is long overdue," said Nancy Goldsmith Zawacki, president of Pittsford Little League. Ken Liesegang, administrator for Little League District 4, which includes Monroe County, and parts of Orleans, Wayne, Livingston and Ontario counties, also supports the change. "It's also going to make the tournament a younger tournament in that we're not going to be seeing 13-year-old players in the World Series or other tournaments going forward once it reaches full implementation," he said. But the change won't take effect immediately for all players. If the new system was immediately used, a player with a 13th birthday after April 30, 2015, who would have qualified under the old rule for the major division next summer, would no longer be eligible and would lose their second year of eligibility. The new rule will immediately apply to players born on or after Jan. 1, 2006, who will turn ages 4 through 9 during 2015. They will use the new eligibility date of Dec. 31 for the remainder of their Little League careers. Some of those players will move to an older division sooner than they would under the old system, but they will still get four years of tournament eligibility. Players born before Jan. 1, 2006, will use the current age determination date of April 30 for the next three baseball seasons. Starting with the 2018 season, all players will use the Dec. 31 determination date. For regular season teams, there is some flexibility in the rules allowing players to be assigned to other divisions if coaches and parents decide it's the best fit. But for tournament teams, such as the all-star teams that play in the World Series, the eligibility dates are strictly enforced. 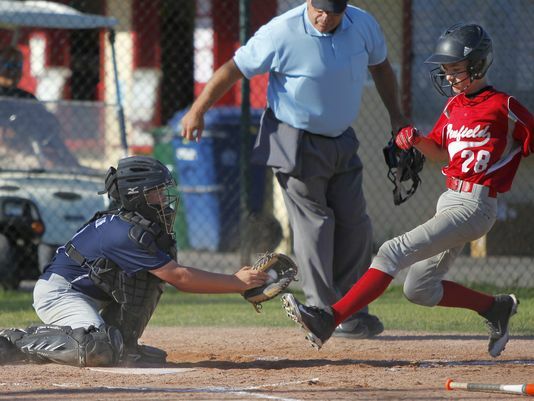 Brian McClintock, director of media relations for Little League, said the change aligns Little League's age determination with the International Baseball Federation. "As baseball works to be reinstated as an Olympic event, aligning our efforts with the International Baseball Federation positions Little League for growth internationally and assists with our efforts to become a global game," McClintock said in an email. •1939: The year Little League baseball started in South Williamsport, Pa.
•2.4 million: The number of boys and girls, ages 4 to 18, who participate in Little League programs worldwide. •16: The number of Little League programs in District 4, which includes Monroe County, and parts of Orleans, Wayne, Livingston and Ontario counties. •9,000: The number of youths who participate in District 4 programs. •2,000: Number of adult volunteers who serve as coaches, managers, concession workers, field maintenance workers and umpires in District 4. •46: The pitching distance, in feet, for the major division and below. •60: The base-path distance, in feet, for the major division and below and for all softball divisions.